Examining the physical mechanisms through which large-scale climate indicators, e.g., El Niño–Southern Oscillation and Indian Ocean Dipole, affect hydroclimatic variables in the tropics and extratropics is a forefront scientific challenge. We examined climatic teleconnections between large-scale climate indices and temperature variability over South Korea. To do this, we calculated not only leading patterns of observed monthly mean and extreme temperature through an empirical orthogonal teleconnection (EOT) decomposition technique but also statistical correlations on a monthly basis using cross-correlation and lag regression analyses for the leading modes and global atmospheric circulation dataset. As a result, the spatial pattern of the leading EOT modes for mean (extreme high) temperature represents an eastern (southern) coastal mode for boreal summer and a northern (middle) inland mode in boreal winter, while extreme low EOTs exhibit a northern inland mode in summer and a western coastal mode in winter. The temporal evolution of the leading EOT modes exhibits a mostly increasing trend and an interdecadal oscillation. The leading EOT modes of mean temperature explain more variance than those of extreme temperature during warm and cold seasons. 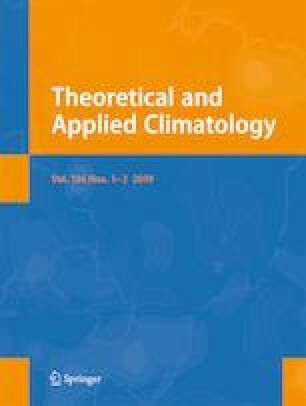 The findings from this study illustrate that tropical ENSO forcing has a coherent association with August and December temperature patterns, while the Indian Ocean Dipole is identified as a driver for temperature variability during fall season. The monsoon circulation over the western North Pacific also exhibits a significant negative correlation with the December temperature EOTs. The leading EOTs for October temperature exhibit the positive correlation with the tropical cyclone variability, while the leading EOTs for mean and extreme high temperature exhibit significant negative correlations with the snow depth over northeastern Eurasia in November. The leading patterns of the August and December mean temperature time series are predictable at up to 5-month lead time from the tropical Pacific sea surface temperatures (SSTs), while a predictable response from Indian Ocean SSTs was detected at up to 4-month lead time.